ESPN has recently published an article explaining their reasoning behind canceling women’s vert from X-Games. Read it here. Although their reasoning has truth behind it, there are many loopholes in ESPN’s analysis. lack of rising young talent? really? What about 14 year old Allysha Bergado? A. I do admit that there are not enough vert ramps outside of San Diego. 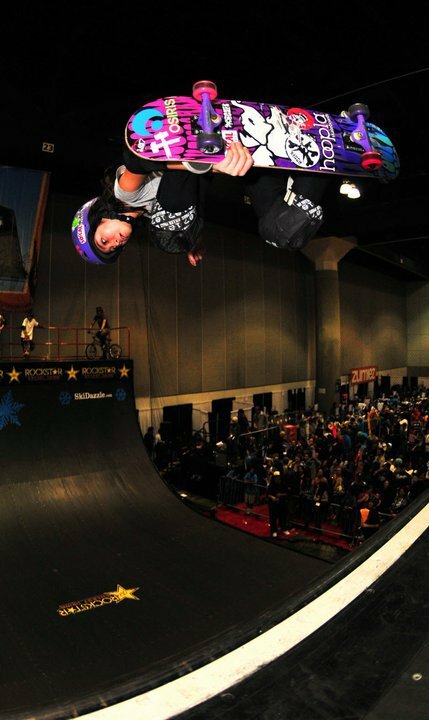 However, women have just as much access to vert ramps as men do. Any yet, the insufficient number of vert ramps has not affected the men’s contest. B. There is a slow, but existing growth in the number of vert ramps outside of SD. However, elimination of vert events will only impede further progress. C. If this is part of their reasoning, then why take out women’s park as well? Parks/bowls/pools are significantly more accessible than vert ramps. Last year they allowed the women to at least skate a demo in the park course- with the intent of turning it into an event in upcoming X-Games. And yet they have backtracked to exclude women’s transition skating completely. A. See Hawk’s previous statement. B. There has been a definite surge in the amount of young girls who skate street, vert, park and all of the above. For example: there were about 40 women competing in the Girls Combi Classic- which is more than double that of the preceding year’s Protec Pool Party- (once again, why exclude women’s park?). A. True, there are very few, if any technical “barriers” or structures through which women and girls can work their way into professional women’s vert skating- this is fed predominantly by reasons 2 & 5. A. Completely true. But rather than stand by us as we hope and wait for the one competition we do have, they have eliminated the last remaining women’s vert event. B. Once again- what about park? There’s a year-round World Cup series for bowl riding, so why not AT LEAST let us skate the giant, fun bowl you build for park? Time to start our own series of vert and bowl events that will force ESPN to re-evaluate our inclusion in next year’s X-Games. estamos en pie de lucha queremos a las mujeres en Vert!! Solid argument…USC is paying off. I don’t need to ask “where have you been” since I see you have a double major, but I do miss the skate sessions.